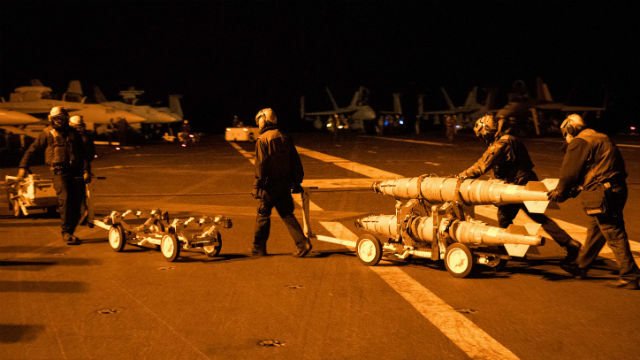 The Pentagon said Wednesday that continuous airstrikes by Navy, Marine and Air Force planes have left ISIS in a “defensive crouch” amid significant loss of its territory. Briefing the Pentagon press corps via video conference from Baghdad, Army Col. Steve Warren said ISIS has lost 40 percent of its territory in Iraq and 10 percent in Syria. An estimated 2,500 enemy fighters were killed in coalition airstrikes across Iraq and Syria in December, Warren added. “We believe that ISIL is now in a defensive crouch…May is when they reached their culminating point of offensive operations. Since then, all they’ve really managed to do is lose ground,” he said. He referred to ISIS by the abbreviation of its official name of the Islamic State of Iraq and the Levant. Warren said that U.S. and coalition planes are also systematically destroying ISIS’ oil infrastructure, in an operation named after one from World War II that ended Nazi Germany’s access to oil. “Since we began Operation Tidal Wave II the coalition has conducted 65 strikes against oil targets. We assess that this operation has reduced [ISIL] revenue by about 30 percent,” the colonel said, noting that ISIL’s production has dropped from 45,000 barrels of oil a day to 34,000 barrels a day. Aircraft have been hitting ISIS targets daily for over a year, and on Wednesday the Pentagon reported 20 separate strikes, including one on an ISIS headquarters building in the terrorist group’s capital of Raqqah in Syria.